A powerful orator, Anderson, who was recently diagnosed with a rare form of adult onset muscular dystrophy, said that although the disease is having a weakening effect on her physically, she finds great strength in finding her purpose as an activist for King’s vision of economic equity and seeing others join the cause. Anderson, CEO of the Empowerment Experiment Foundation, has a law degree and MBA from the University of Chicago, and is married to John Anderson, a Northwestern Kellogg School of Management graduate (MBA ’99). Inspired by the election of President Obama and a desire to do more for the black community, the Oak Park, Ill.-based Anderson and her family, including two young daughters, embarked on a social experiment in 2009 to provoke more action and unity around economic equity. They made a public pledge to support only black-owned businesses for an entire year, prompting a study by the Kellogg School of Management to examine the statistical relevance on the economic impact of their experiment. Anderson spoke of the hardships her own middle-class family endured that put them in touch with the everyday struggles experienced by black people living in food deserts with overpriced, inferior food options. To stick with the commitment they made, the family had to drive farther and look harder to find black-owned businesses to meet the family’s needs. She recalled that their children sometimes went to school in clothes that were too tight because of the dearth of children’s clothing stores, often begging for a banana or other favorite foods that were scarcer than the sweet cereals and fast food found in gas stations and convenience marts. The experiment brought many hard realities and economic disparities into view, which Anderson chronicled in her 2012 book “Our Black Year: One Family’s Quest to Buy Black in America’s Racially Divided Economy,” including the fact that dollars stay in the black community an average of just six hours, because the majority of businesses operating in black communities are not owned by people who live in the community. According to the Kellogg study only 2 to 3 percent of black dollars stay in the community where they are spent. The study also found that if black households of $75,000 or more increased their spending in black-owned businesses to 10 percent of their discretionary income, the resulting flow of cash in the community would have the potential to create a million new American jobs. Anderson challenged attendees to join the empowerment experiment by supporting black-owned businesses in their communities and hiring black suppliers for their businesses. Senior Derick Wallace, Weinberg ’19, helped welcome guests and explained the MLK Commemoration Committee had focused on King’s messages about economic equality as a theme for this year’s choice of keynote speaker and event programming. 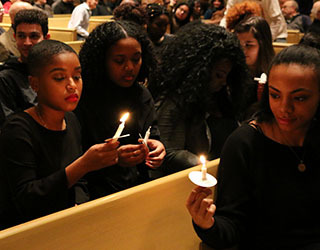 Approximately 200 members of the campus and community attended the 40th annual Candlelight Vigil hosted by the Alpha Mu Chapter of Alpha Phi Alpha Fraternity Jan. 21. The cold winter evening would have marked the 90th birthday of Dr. Martin Luther King Jr. Spoken word artist Timothy Mays performed two of his poems, “Fighter” and “This is the Year,” which championed the resilience and hope required to pursue a dream through life’s many adversities. Rounding out Northwestern’s MLK Commemoration and Dream Week activities were community service projects for Chicago and Evanston nonprofit organizations, an arts festival, panel discussions, youth programming, a documentary film screening, an oratorical competition and the annual Harambee: Black History Month Kick-Off event hosted by Multicultural Student Affairs and For Members Only.